SimpleTuition, a company that offers online tools, tips and advice to college students to help them save money on education-related expenses, is announcing this morning that is has acquired ValoreBooks, an online textbook marketplace that offers discounts on rentals as well as new and used textbooks. Launched in 2006, SimpleTuition has been on a mission to help students reduce the seemingly ever-escalating cost of a college education, beginning with student loans. The company developed a “Loan Comparison” tool that allows students to find and compare affordable private and federal loans from providers like Wells Fargo, SallieMae, PNC and SunTrust. Along with loan comparison, SimpleTuition gives students tools to manage debt, find scholarships and plan their finances, like its recently-launched rewards program and online checking account. The acquisition of ValoreBooks, says SimpleTuition co-founder and CEO Kevin Walker, is meant to help the company continue to expand its suite of savings-focused products. Behind tuition and room and board, textbooks represent the third highest cost for college students. 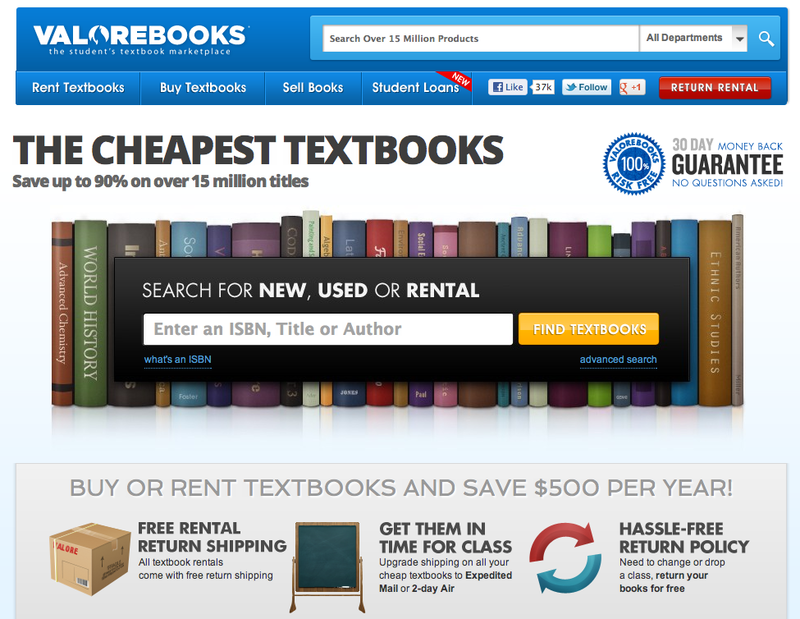 ValoreBooks has been around since 2002 and has built a steadily-growing price comparison marketplace for textbook rental and purchasing. So, for SimpleTuition, snapping up a veteran of the space rather than building their own makes sense. It may not be Chegg, but the marketplace now includes over 18 million titles from 20,000 sellers. Not bad. The acquisition also doubles the startups’ collective traffic. Since navigating through some controversy early in its history, SimpleTuition has grown steadily and the CEO tells us it’s on track to have 6.5 million visitors in 2012. ValoreBooks, on the other hand is expected to hit 5.5 million this year, so collective (factoring in overlap in audience), Walker projects that the sites will together see over 10 million uniques in 2012. What’s more, SimpleTuition began to break-even in 2010 and hit profitability in 2011. And though the company isn’t disclosing exact figures, revenue for 2011 was in the “eight-figure” range with the top line growing by 30 to 40 percent over the past three years. The companies have also elected not to disclose purchase price, though SimpleTuition did use a combo of cash and stock as deal consideration. We do also know that SimpleTuition has raised $17 millon in venture capital to date, while ValoreBooks has been bootstrapped from the get-go and has been at “break-even for the past couple of years but will finish 2012 profitable,” according to Walker. Given these factors, I’d estimate the deal was somewhere in the $5 to $10 million range. Though this is an estimation, and we’re trying to confirm with sources. There are also some clear parallels between this acquisition and Rafter’s purchase of HubEdu. Rafter is formerly known as BookRenter — another old-hand in the textbook space and an original competitor to Chegg. But BookRenter rebranded recently. Why? To become a full-service suite for course materials. Is it because everyone’s scared of Barnes & Noble and Amazon? Well, Amazon’s new paper textbook rental service and the fact that it’s the go-to name in eBooks may not have everyone running in fear, but it also casts a pretty big shadow in the industry. Not surprising to see the secondary players making the intelligent decision to join ranks with deeper service providers. After all, at the end of the day, there’s more money (and disruptive potential) to be found in becoming that end-to-end solution for students — an educational OS. And with the cost of education rising, ValoreBooks and SimpleTuition probably have a better chance to reach more students by joining ranks than by going solo against the Amazons and Cheggs of the world.